Ken Skeens is a folksinger, guitarist of Appalachian heritage and an award-winning songwriter of original songs whose subjects range from the environment, preservation of nature to songs about spirituality, social issues, Americana, and heart and home. Ken's acoustic music is mellow and thought-provoking. 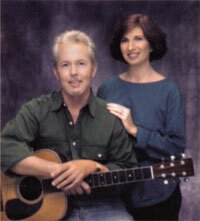 Ken won the Will McLean Award for songwriting in 1992. His three entries finished 1st, 2nd, and 3rd. He also placed 1st in the "I Remember Gamble" song contest in 2002. Ken and Leigh have been singing together since 1993. They sing at various venues and folk festivals around the state such as the annual Florida Folk Festival (White Springs, FL), Will McLean Music Festival (Dade City, FL), Gamble Rogers Festival (St. Augustine, FL), Sierra Club, Mennello Folk Art Museum, and other acoustic venues and special events. They are members of FOFF (Friends of Florida Folk) and Ken's song "Old Florida River" was used as part of a radio program (Appalachiacola Doin' Time) that won the "Edward R. Murrow Award" for best radio documentary in 2000. The title song on the most recent CD, "Down A Barefoot Road" written by Ken, will take you back to a simpler time and place.